This week, we're heading into Christmas, so I'm starting to favour my favourites. 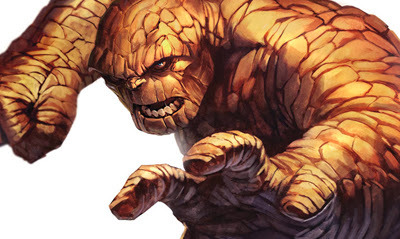 Hence why today's track tackles my favourite Marvel man of all, The Thing. While the lyrics are explicit and I'd think Benjamin Grimm was more suited to rock (see what I did there - clever huh? ), the hero of the piece just can't be beaten. What do you think? For the full explicit lyrics to this song, click here. To buy this track, visit itunes.com and join me back here next Monday for another Comic Beat! Thanks Dale! People always give up traditions close to the end of the year and as usual it's always the wrong ones they give up first. Theres an unfortunately weird individual over on our FF forum who has a crush on good ol' Benjamin J and I hope to God she never gets to hear this - she over analyzes everything he says!